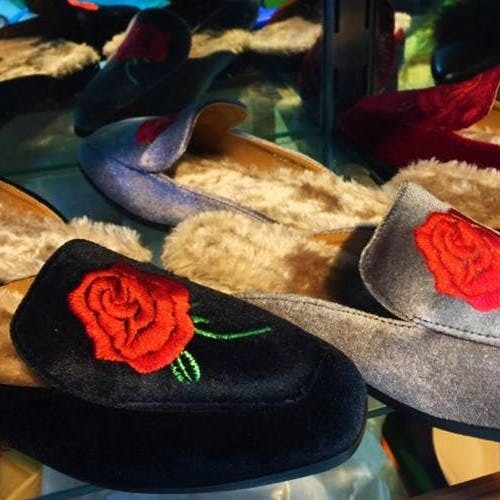 Shoes With Gorgeous Embroidery, Bags & More: Have You Been To Simpark Mall Yet? We took a stroll around Simpark Mall — located below New Market — and found loads of stuff that caught our eye. Not everything here is worth picking up, but if you look around with some time and patience, you’ll come across stuff you’d love to take home. We found these amazing embroidered block heels at Bebo Footwear that come in different colours such as maroon, blue, grey and black. At INR 500, they are a steal (we didn’t bargain, but the shops here are open to discuss better prices, so feel free). They also have a variety of boots and oxford heels which started at INR 600. You can find some similar embroidered shoes (flats) at Miracle as well for INR 550. White sneakers are still quite the in thing right now. Look for AIZWAL FC — owner Shabbir Ali stocks a host of these, along with several in eye-popping reds and pinks. We loved the white ones with golden stripes (for INR 500). He also keeps flat sandals which start at INR 200. Leather In has a jaw-dropping collection of classy leather bags which start at INR 1,500 (again, whittle down the price with some bargaining). They also keep leather wallets, laptop bags, purses and files.They also customise leather bags — you can order something in a colour you want and design, and they will make it for you. And the best part is they will deliver it to your home after it’s done. The Miracle store stocks some funky bagpacks — the ones with studs stand out. All the bagpacks are priced at INR 600. You can also pick up bright pouches for around INR 50. Several shops stock a variety of great leather jackets in different styles. This a maroon biker jacket with zips at Twist comes for INR 1,500. We came across a dapper grey, striped blazer at Hello Kitty going for INR 700. Love no-fuss wear like sweatshirts? Glam Shack stocks many styles like this Felix the Cat pullover (INR 550). This grey poncho top at Pep Gals (also available in red) was for INR 1,000.